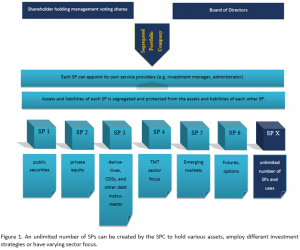 The SPC corporate structure is frequently used for multi-class hedge funds, umbrella funds and master-feeder structures owing to the various benefits of the SPC structure. SPC provides ability to set up a statutory “ring-fence” to protect against cross liability issues relating to the assets and liabilities of the various SPs within a SPC. The annual Government fees for an SP is 50% less than the annual Government fees for an exempted company. The SPC is a Cayman corporate structure, like a standard exempted company, where there are no residency restrictions on Directors or Shareholders. There are no exchange control restrictions. There are no Cayman taxes on the SPC or its shareholders, among other benefits. As shown in figure 1 below, the SPC structure is used increasingly as an investment platform on which investors can use different SPs to hold varying asset classes (e.g. real estate, intellectual property, stocks and shares, and distressed assets) and have their investments managed separately from other investments held by other SPs on the same SPC platform. What are the features of a Segregated Portfolio Company? Cayman Companies Law permits an SPC to create one or more SPs in order to segregate the assets and liabilities of the SPC held within one SP from the assets and liabilities of the SPC held within another SP of the SPC. The general assets and general liabilities of the SPC (i.e. assets and liabilities which cannot be properly attributed to a particular SP) are held within a separate general account rather than in any of the SP accounts. The Companies Law requires an SPC to make a distinction between “segregated portfolio assets” (which are assets of the SPC that have been designated or allocated for the account of a particular SP of an SPC) and general assets (which are assets of the SPC that have not been designated or allocated for the account of any particular SP of the SPC). Each SP should have, as appropriate, its own bank account, brokerage account, and other accounts to hold its assets to avoid co-mingling with the assets of other SPs. How are SP assets comprised? – The assets of an SP comprise (a) assets representing the share capital and reserves (“reserves” include profits, retained earnings, capital reserves and share premiums) attributable to the SP; and (b) all other assets attributable to or held within the SP (e.g. bonds, stocks, real estate, IP). Shares of the SPC are permitted to be issued in respect of a particular SP, the proceeds from the issue of such shares are included in the assets of that SP and the shares may carry the right to distributions from that SP. The proceeds of the issue of shares which are not segregated portfolio shares shall be included in the SPC’s general assets. The Companies Law also requires an SPC to make a distinction between “segregated portfolio liabilities” (which are liabilities of the SPC that have been designated or allocated for the account of a particular SP of the SPC) and general liabilities (which are liabilities of the SPC that have not been designated or allocated for the account of any particular SP of the SPC). to segregate, and keep segregated, portfolio assets separate and separately identifiable from general assets. to segregate, and keep segregated, portfolio assets of each SP separate and separately identifiable from segregated portfolio assets of any other SP. to ensure that assets and liabilities are not transferred between SPs or between an SP and the general assets otherwise than at full value. Who controls the SPC? – The SPC will have a Board of Directors. In addition, each SP can have its own segregated portfolio directorate or investment or management committee which effectively controls and manages the operations of the relevant SP.The segregated portfolio directorate, investment or management committee would obtain its powers through powers delegated to it by the Board of Directors of the SPC. Contracting on behalf of an SP – Whilst the SPC is a company and therefore a corporate entity with separate legal personality, an SP does not have separate legal personality. Accordingly, the Companies Law requires that when contracting on behalf of a particular SP, it should be made clear which SP the SPC is contracting on behalf. Each SP can have its own investment manager, trading advisor, and other service providers but it should be made clear in the agreements which SP of the SPC has engaged them for their services. For example, if ABC Investments SPC enters into a trading advisory agreement to engage a trading advisor for segregated portfolio A1, the SPC should make it clear in the agreement that it is acting as: “ABC Investments SPC acting solely for and on behalf of segregated portfolio A1”. The trading agreement should also be executed as: “ABC Investments SPC acting solely for and on behalf of segregated portfolio A1”. Who can bind an SPC or an SP? – The SPC has the capacity to enter transactions “acting solely for and on behalf” of one or more SPs as stated above, the SPC must identify the relevant SP and state that it is: “acting solely for and on behalf of” the particular named SP. It is the Board of Directors of the SPC (or other person to whom the Directors have delegated authority, e.g. the investment manager) that will be able to bind the SPC and the relevant SP in respect of which the SPC is acting. Directors at SP level? – There will not be a Board of Directors as such at the SP level because it is not a separate corporate entity. However, often the Board of Directors of the SPC in a fund structure will delegate management of the SPC and/or the SPs to an investment manager or to an investment or management committee. Can assets be transferred between SPs? – The Companies Law requires the Directors of the SPC to ensure that assets and liabilities are not transferred between SPs otherwise than at full value. Rights of creditors – The Companies Law requires that segregated portfolio assets must only be available and used to meet liabilities to the creditors of the SPC who are creditors in respect of that SP and who shall thereby be entitled to have recourse to the segregated portfolio assets attributable to that SP for such purposes. Segregated portfolio assets should not be available or used to meet liabilities to, and shall be absolutely protected from, the creditors of the SPC who are not creditors in respect of that SP, and who accordingly shall not be entitled to have recourse to the segregated portfolio assets attributable to that SP. Accordingly, a creditor will only have recourse to assets from SPs with which it has contracted and creditors will have no recourse to the assets of other SPs of the SPC which are protected under the Companies Law. This statutory protection afforded under the Companies Law to the assets of each SP is one of the key feature and benefit of the SPC structure. Transfers to General Assets to meet expenses – Sometimes the Articles of Association of the SPC empowers the Directors of the SPC to transfer segregated portfolio assets to the general assets of the SPC (and, if more than one SP is in existence, pro rata in proportion to the net asset value of each SP or in such other proportion as the Directors determine) in order to discharge the following liabilities: government registration fees, annual return fees, professional fees, service provider fees, taxes, fines and penalties and any other liabilities or a recurring nature necessarily incurred in maintaining the continued existence and good standing of the SPC. Segregation of Liabilities and rights of third parties – The liabilities to a person arising from a matter imposed on, or attributable to, a particular SP, only entitle that person to have recourse to that particular SP in the first instance and then to the general assets of the SPC, unless the Articles of Association of the SPC prohibits payments from the general assets of the SPC, in which case there is no recourse to the general assets.